Mount Pleasant Winery – Open Full Time! We have opened again full-time, 7 days a week, from 11 am – 6 pm. We continue to provide live music on Saturdays from 4 – 6 pm. 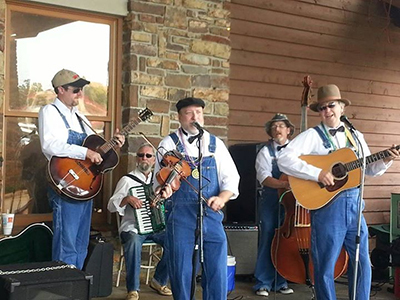 This Saturday, the 22nd, enjoy the bluegrass/comedy of The Sons of Britches, along with an invitation to the Branson Arts Council Art Open House featuring the White River Art Alliance, also from 4 – 6 pm. This is a great opportunity to meet these young and upcoming artists, Aaron Murphee, Christina Mutchler, Chante Payne and Seth Murphee. Enjoy refreshments provided by the BAC along with wine tasting for $5.00, or you may purchase wine by the glass, or by the bottle to be enjoyed at the winery! It’s a great time to come out and support our local musicians and artists! We’ll see you Saturday! Branson, MO – Branson Tourism Center’s Graphics Department was recently recognized when their Main Street Lake Cruises brochure was named a first-place Regional Winner in the International Association of Professional Brochure Distributors 2013 International Best Brochure Competition. From a possible field of more than 19,000 brochures representing the Association membership, entries were narrowed down to a list of 73 in Mexico City. These nominated brochures were then evaluated through competitive comparisons using specific criteria. The attractive, user-friendly brochure contained the most useful information about the yacht cruise, dining, and marina operation, while showcasing the natural beauty and wildlife of the Branson area; wildlife that includes American Bald Eagles. Main Street Lake Cruises is conveniently located at Branson Landing adjacent to historic downtown Branson, Missouri. They offer a variety of lake cruises for groups or individuals, including romantic Dinner Cruises, beautiful Sunset Cruises, historic Sightseeing Tours, as well as Holiday Cruises and Special Events like the popular Cruise with the Stars. For more information on services provided by Branson Tourism Center, visit www.BransonTourismCenter.com or call 800-990-2024. Popular veteran Broadway, Disney, Las Vegas entertainer RON SANTULLI begins performing 3 days a week on Thursdays, Fridays and Saturdays from 8:00 p.m. to 10:00 p.m. at GRANDMA RUTH’S (located across from the Stone Hill Winery) at 607 State Hwy 165 (Gretna Rd) #4, Branson, MO 65616. Known as “THE BRANSON CROONER”, Ron sings a wide range of songs made popular by such artists as Frank Sinatra and Dean Martin but don’t be surprised if you hear a little Gaga or Katy Perry as well. For 3 years he performed here at The Night Light Christian Nightclub and last season was TODD OLIVER’S MC for 6 weeks. Other performers at GRANDMA RUTH’S include bluegrass favorites SONS OF BRITCHES and Cowboy Performer JOHN FULLERTON. For more info, call (417) 231-5900 or visit Grandma Ruth’s Facebook Page. Clint Black has long been heralded as one of County music’s brightest stars. His many talents have taken him even further, as Black has transcended genres to become one of the most successful artists in all the music industry. To date, Black has written, recorded and released more than 100 songs, a benchmark in any artist’s career. An astounding one-third of these songs eligible for major single release also achieved hit song status at Country radio, while more than 20 million of his albums have been sold worldwide. While it’s well-known that Black is an accomplished singer and guitarist, people may be surprised to learn that he is also proficient on drums and the harmonica. In 1989, Black released his critically acclaimed fan favorite and triple platinum Killin’ Time marking a shift in the industry with traditional country sounds. CMT list this album as one of the 100th Greatest Albums in Country Music. Clint black proves that on stage or appearing in such shows as the Celebrity Apprentice, he is a class act and a must see while you are in Branson. Returning for a second season at the King’s Castle Theatre, we would like to invite all to join us as we open our 2014 season with Dancing Queen on February 13, 2014 at 8pm! Also returning for its third season is New Jersey Nights! The music of Frankie Valli & the Four Seasons. 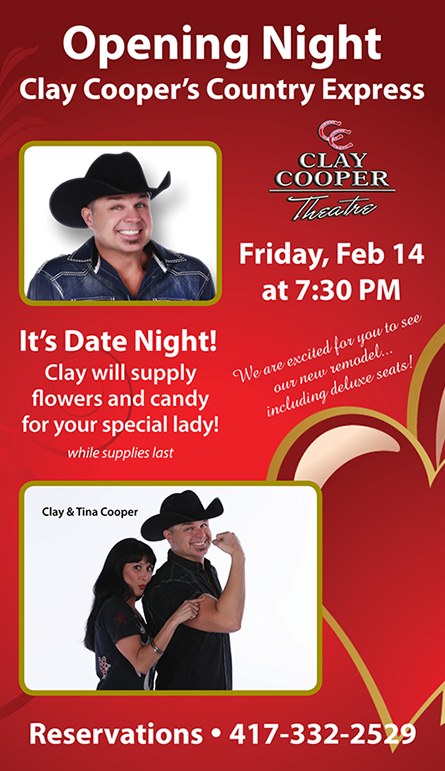 Opening night is February 20, 2014 at 8pm. New to King’s Castle Theatre: Dublin’s Irish Tenors & The Celtic Ladies! Two superb Irish groups together in one magical concert. Join us on February 27, 2014 at 8pm as we open for their first performance of 2014.